Another childhood treasure recovered via the local library sale, Yay! 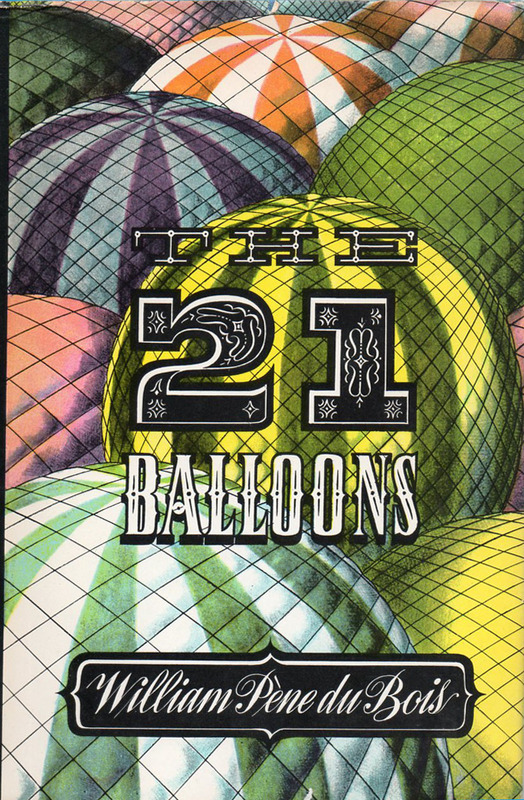 The 21 Balloons by William Pene du Bois was published in 1947 and won the Newbery Award in 1948. Which it totally deserved. I borrowed this from the library as a child and was enchanted by the rollicking adventure story therein. I spotted the spine at the library sale and yoink, it was mine! 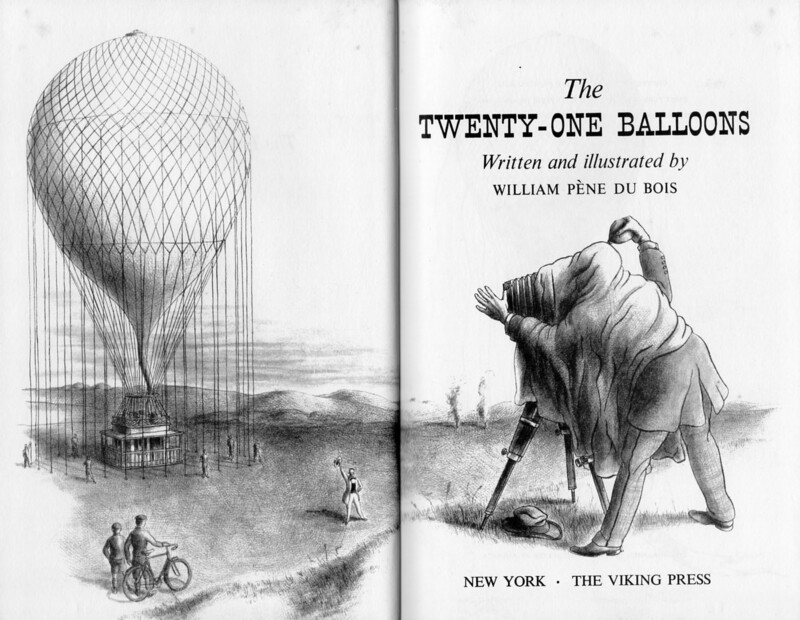 Rereading it reaffirmed my memory of it being fast-paced, wild, and just chock full of bizarre inventions and architectural wonders. It is the story of a retired schoolteacher who resolves to spend a year aloft in a specially constructed airborne house. 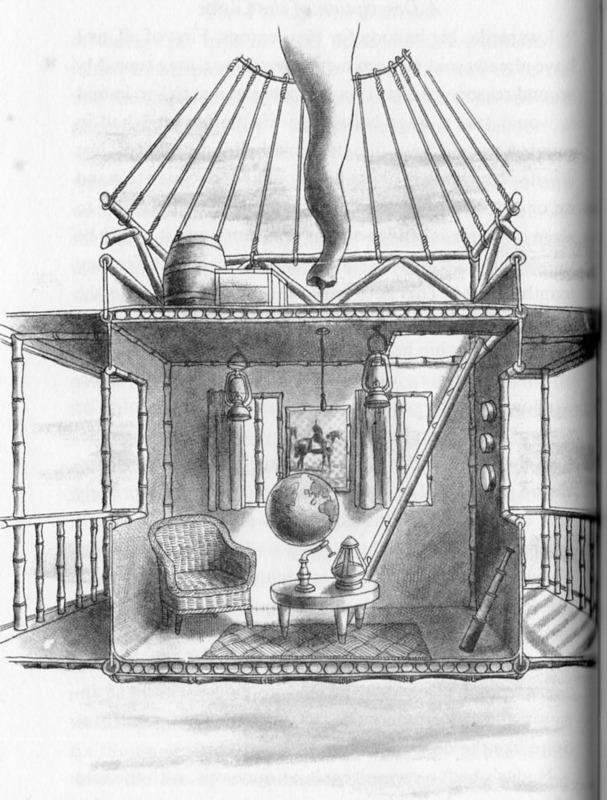 The house/balloon is where you start to see some definite steampunk influences. Of course his trip does not go to plan, he ends up crashing in the ocean and shipwrecked on Krakatoa. Yes, Krakatoa, and not at all long before it exploded. Wow! 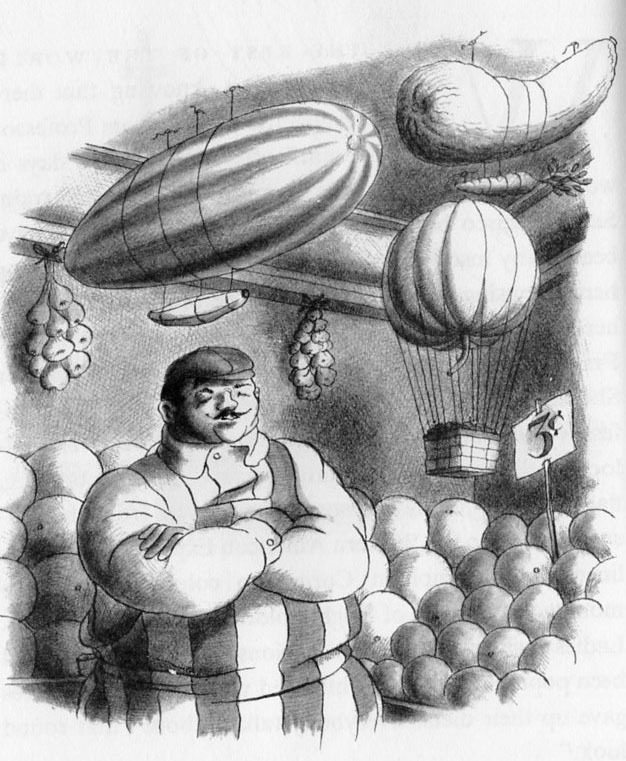 The book is all about his adventures in ballooning and his interactions with the rather bizarre inhabitants of a secret colony on the isolated island. The island is where steampunk meets surrealism in earnest. The above image is from the “electric house” with a living room full of bumper-car chairs and a couch that holds four children and goes the fastest of all the furniture. What a scream. 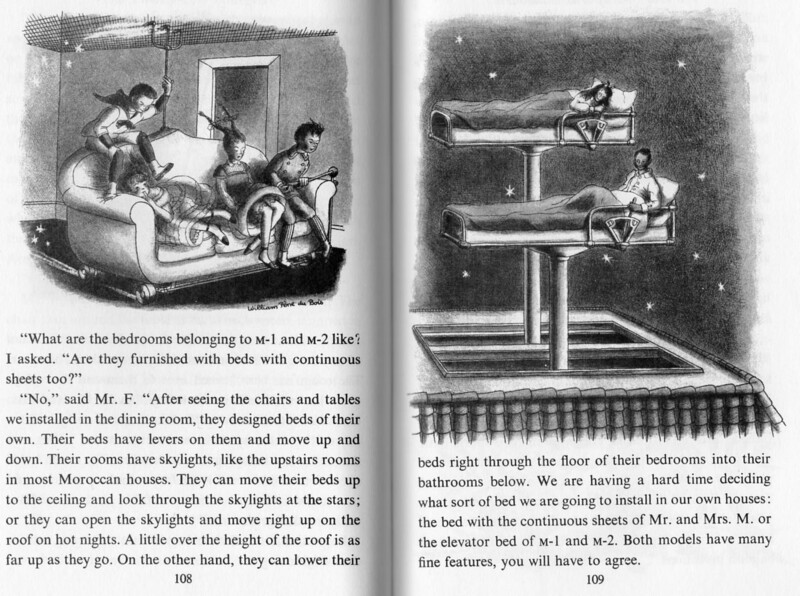 At night they sleep in elevator beds. And every single house has a different and often highly imaginative architectural style. What Fun! Even their leisure activities are different. Check out the Balloon Merry Go Round. I just love the way this is depicted in a technical sort of diagram showing how it works. 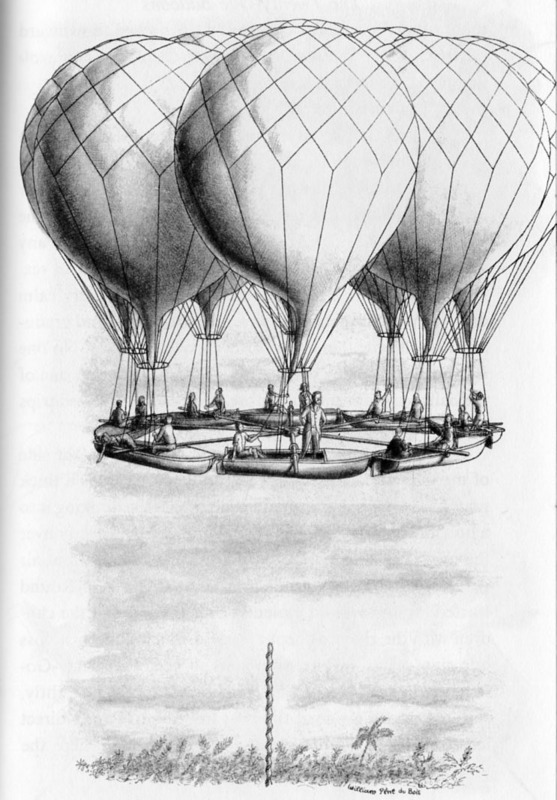 And then as an illustration showing the children in it in mid air. The way in which this book is written is kind of unique. 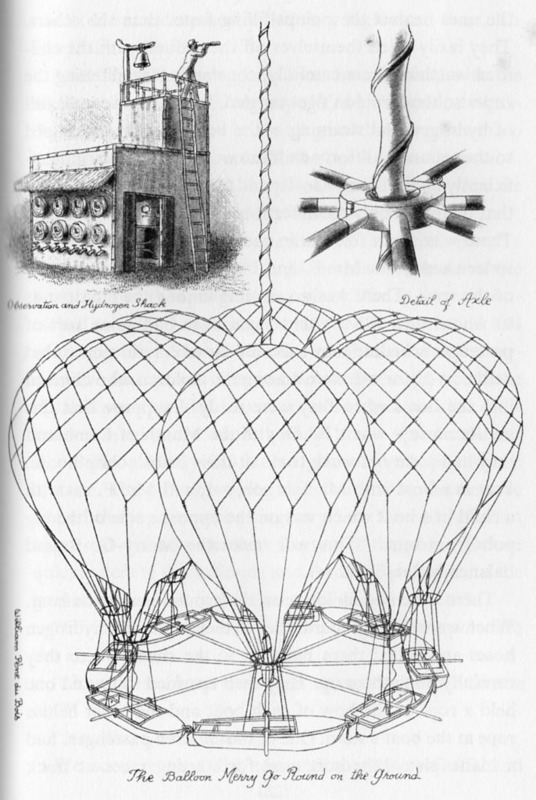 It’s a fascinating mixture of actual history and fantasy inventions. It has a dry wit that I found highly entertaining. My favorite line is a newspaper headline after the teacher is found in floating in his escape vehicle: “PROFESSOR SHERMAN IN WRONG OCEAN WITH TOO MANY BALLOONS, and the subheading: Refuses to Explain How or Why“. Even the illustration style is perfect for this story. The above image is a vegetable stall decorated for the professor’s homecoming celebration. Love that watermelon and banana zeppelin. From the many, many reasons to find this book worth reading I highly recommend that you choose one and seek out a copy. It’s still in print which I think is just dandy, and there are plenty of vintage copies available is you prefer that sort of thing.